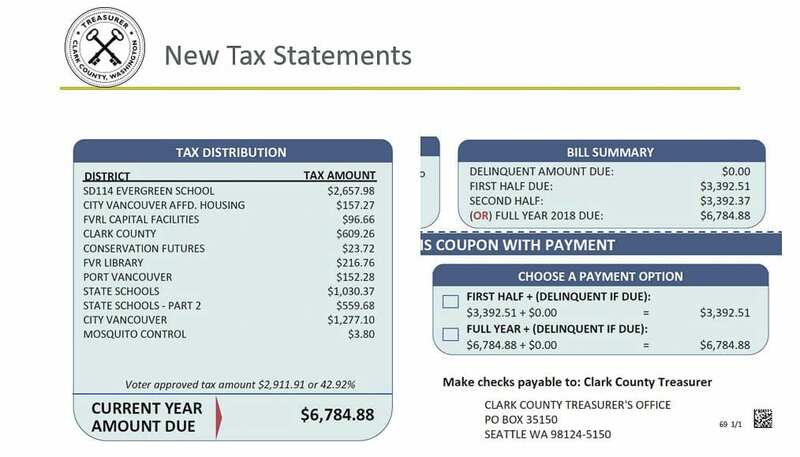 VANCOUVER — Homeowners across much of Washington state were shocked last year when their property tax bills went up sharply, sometimes by 10 percent or more. Most are due for some relief this year, but that could be a short reprieve. 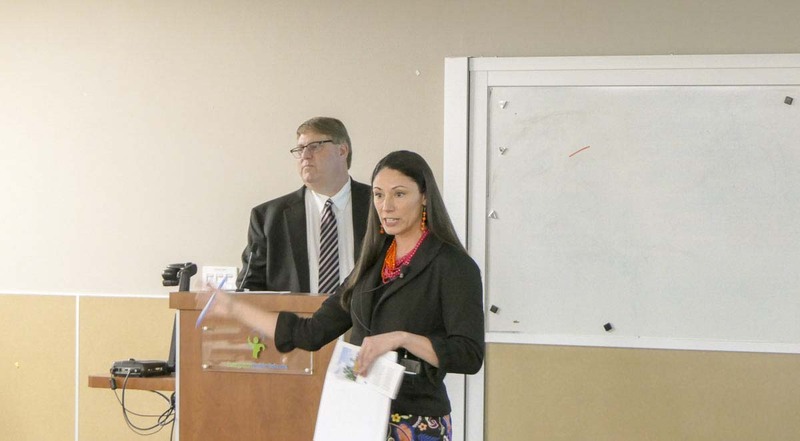 That was the upshot of a recent town hall meeting held by newly re-elected Clark County Assessor Peter Van Nortwick, and Alishia Topper, who was elected to replace long-time county Treasurer Doug Lasher who retired in January. Topper and Van Nortwick spent some time explaining how their two departments work independently, but also as a team. 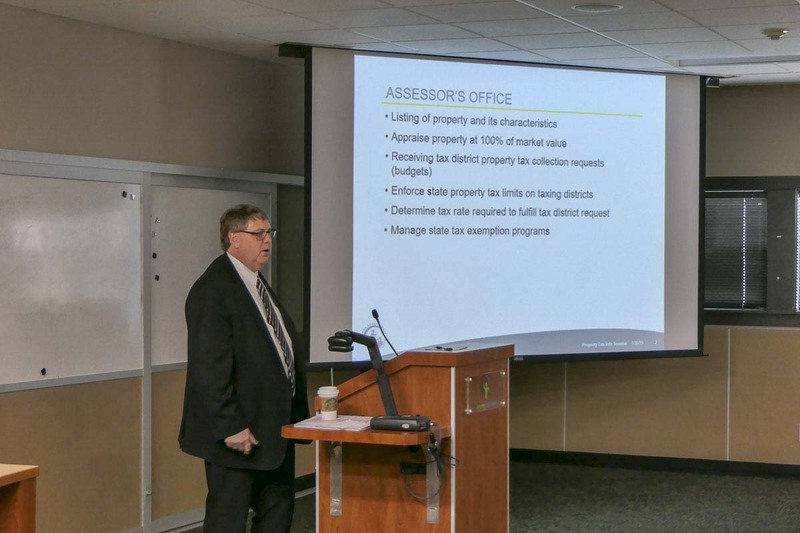 The assessor’s office is responsible for setting tax collection rates in order to meet budget requirements, and determining the value of homes in order to set tax percentages. The treasurer’s office acts as a bank for county departments and the various taxing districts, and also invests bond money until it needs to be paid out. The shock of 2018’s property tax increases came from a perfect storm of different factors. Chief among them was the legislature’s move to fully fund basic education in the state as part of the McCleary mandate. It raised the statewide property tax rate for basic education to $2.70 per $1,000 of assessed value. In exchange, local Maintenance and Operations (M&O) levies were capped at $1.50 per $1,000. But that cap didn’t go into effect until this year, so homeowners were hit by both state and local taxes in 2018. 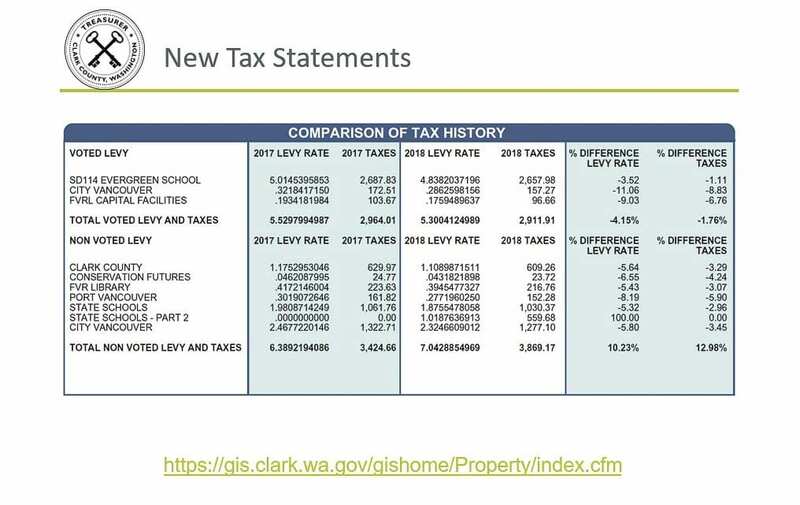 Add to that the fact that home values are factored based on sales from the previous year, and 2017 was a hot housing market for Clark County, and homeowners were justifiably frustrated over their bills. A lot of questions from the audience centered around how Van Nortwick’s office actually goes about estimating the value of a home. It can be confusing, Van Nortwick admitted, to realize that it’s not your actual home being assessed at its actual value, but rather a formula based on your neighborhood, the features of your house, and what similar homes are going for. And it’s not just people who feel the value of their home has been overestimated who call Van Nortwick to complain. With the levy caps now in place, property owners can expect to see their bills drop this year, but to varying degrees. 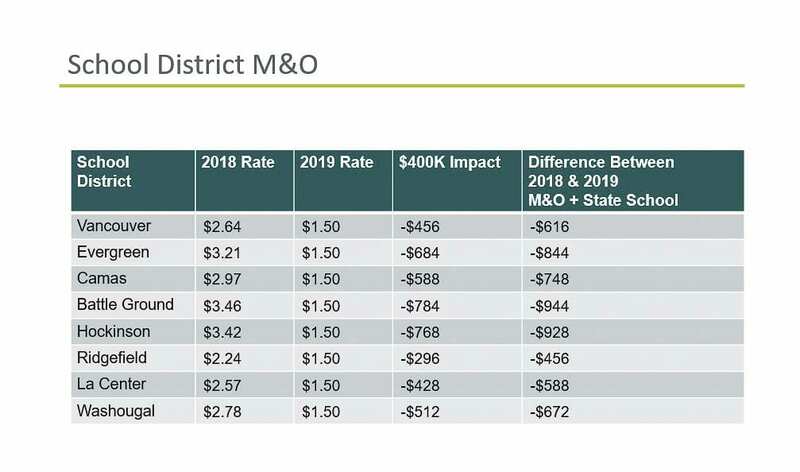 La Center is the lone outlier among Clark County cities, due to a building bond they approved last year, and if Ridgefield voters approve a new building bond this month, it is expected to add around $1.06 per thousand to an average home. “We’re actually collecting $16.9 million less for the Vancouver School District this year,” said Van Nortwick. Numbers are similarly grim for other levy-dependent districts. Evergreen is losing $24.5 million in local funding, Battle Ground is losing $15.9 million, and Camas is losing $7 million. 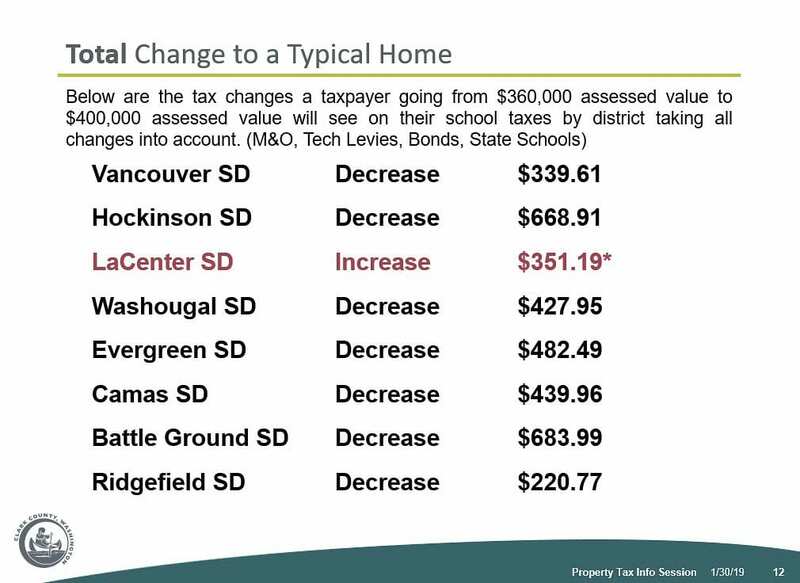 The overall changes should see the tax bill on a $400,000 home go down across most of Clark County. Battle Ground, for instance, will collect around $928 less per home than in 2018. Of course, with home values still climbing, and taxes now set at a specific amount per thousand, residents of that city won’t actually save that much. A home that was worth $360,000 in 2018 is likely to be valued at around $400,000 this year, so the actual tax savings in a place like Battle Ground is likely to be closer to $684. La Center, as mentioned, will see an increase due to the building bond approved by voters. Another issue is the switch to a rate-based levy funding system, as opposed to budget-based. Previously districts set the total they wanted to raise through an M&O levy, and the assessor set the rate to collect that amount. Now, with the cap in place, Battle Ground School Board President Troy McCoy said it’s making budgeting much more complicated. Already there are discussions in Olympia about raising local levy caps, or at least adjusting them in some cases, but Topper and Van Nortwick said they couldn’t speculate about what lawmakers might do before this session ends. Van Nortwick points out that a budget-based system can actually be easier on homeowners, since it’s less prone to market fluctuations. On the other hand, a flat-rate system like what’s in place both locally and statewide can end up costing more if home prices rise sharply, since the money is simply collected based on values and distributed. 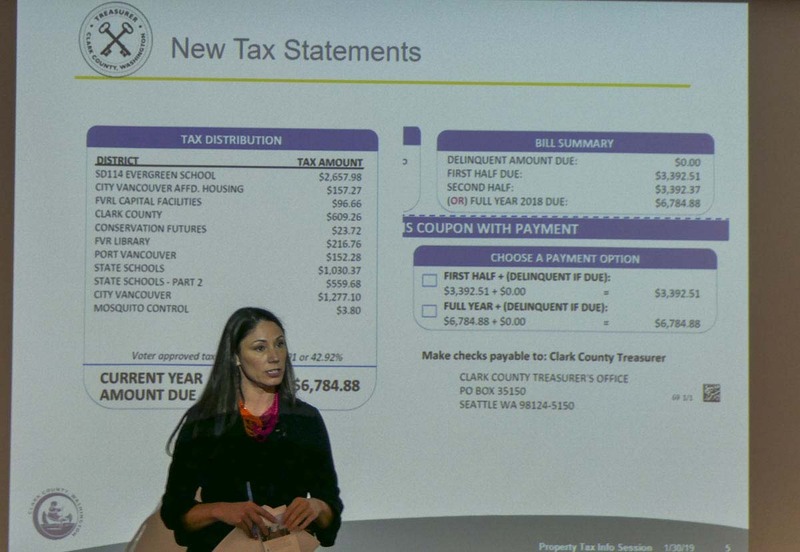 A couple of changes are coming to property tax statements this year. First, budget cuts mean anyone whose taxes are paid out of an escrow account as part of their mortgage will no longer receive a postcard notifying them of who is paying their tax bill this year. For people who pay themselves, they’ll see a slightly different looking statement. Topper says it will do a better job of outlining who is getting a piece of your tax money. It also shows how much of that was for voter-approved items. “Meaning you, or your neighbor, voted to tax themselves to fund a specific project,” says Topper. The sample bill she showed included nearly 43 percent voter-approved money. New bills will also provide a breakdown of taxes in the two previous years, to make it more clear where costs are going up, where they’re going down, and by how much. “We just want to make sure that everybody fully understands why they’re getting a bill, and what it pays for,” said Topper.